Tamworth Castle is a lovely day out for all the family! The Castle has a wealth of history to be explored with opportunities for everyone to touch and use some of the items we have on display. All the family can get try out traditional tasks and domestic chores, all part of the daily life of the Castle household. 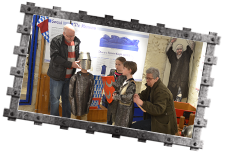 In the Castle’s new armoury why not try on the armour and feel the weight of the swords then make your very own coat of arms. Be the centre of attention and sit at the dining table set for a Tudor banquet, where you can pick up and use the items on display to get the full Tudor experience. You can find out about the food in the Ante-Chamber so have a go and crush your own herbs and spices with a pestle and mortar. 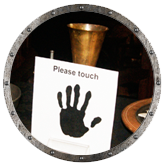 Explore Tamworth’s history in our Tamworth Story, which now has a large Saxon Exhibition where visitors are able to write their name in Saxon runes, try out some brass rubbings, make a magnetic sword and see real pieces found as part of the Staffordshire Hoard. Release your inner Georgian when you try on the wigs and hats and imagine Georgian life wearing these ridiculous wigs! Our events really get the whole family involved trying the day-to-day tasks of the castle household. Meet characters from different times in the Castles history where you can try cleaning clothes with the Medieval Laundress or see science in action with our Georgian scientist. 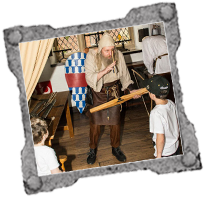 There is something for everyone here at Tamworth Castle whether you’re a keen dancer or here to join in the battle. See our Events page for more details on the events throughout the year. The Castle is set in a lovely park with good facilities and you could plan to go bowling as part of your day, enjoy a picnic on the river bank or a quick round of crazy golf. Take a look at our ideas for family fun in Tamworth!